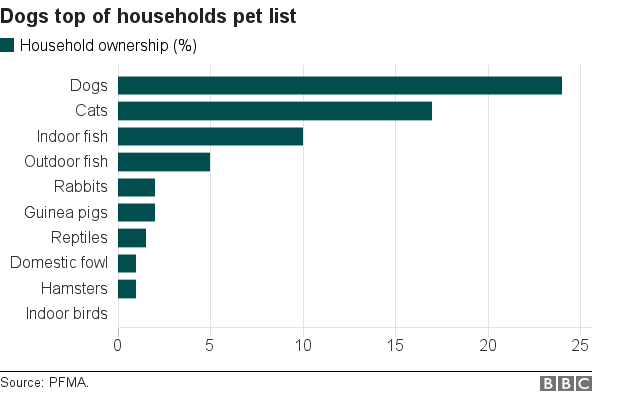 When it comes to the cost of owning a pet, many people in the UK are finding that there’s just not enough money in the kitty. 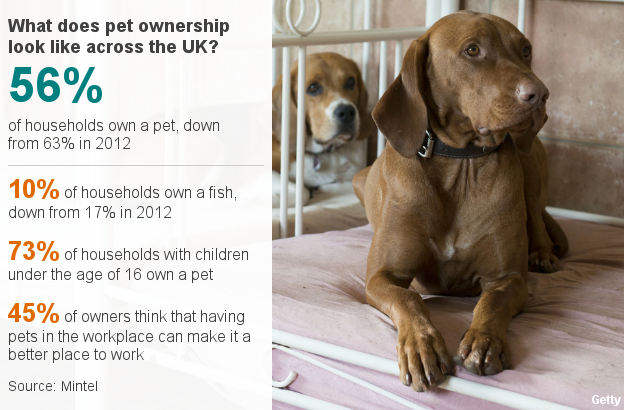 Modern economic pressures mean that fewer households now own a pet. Just 56% now have one, down from 63% five years ago, say retail analysts Mintel. 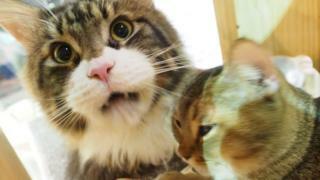 Because many people cannot afford to buy their own home, more are renting from landlords who don’t allow animals. 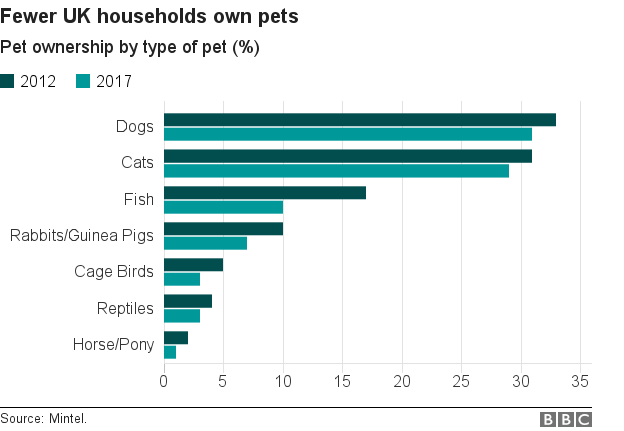 Ownership of pet fish took the biggest dive. Fish ownership, including goldfish and tropical fish, was down from 17% of households in 2012 to 10% this year. Guinea pigs, rabbits and mice have also fallen out of favour. In 2012, 10% of households kept them, but the level is now down to 7%. In homes that do have children, the proportion of pet ownership is much higher than for the population in general. In all, 73% of households with children under the age of 16 own pets. But among older people, the figures fall significantly. Only 36% of those over 65 have a pet. Dogs and cats are still the most popular pets, ranking well ahead of other categories of domestic animal. But both have lost ground in the past five years: dog ownership has fallen from 33% to 31%, while for cats, ownership is down from 31% to 29%. And there is a clear gender divide between the two. Among men, 33% own a dog while 27% have a cat, showing that canines are still living up to their reputation as man’s best friend. At the same time, 32% of women own cats, with 29% owning a dog. The trend away from owning pets has taken its toll on the High Street. In September, pet shop chain Just for Pets, which had 25 stores across England, went into administration, with owners blaming what they called changes in buying behaviour. But last month, Pedigree Wholesale bought up the company for an undisclosed sum, saving 18 out of the 25 stores and securing 180 jobs.